Photo by Jang Hyun-Woo/ Beyond a barge and tug boat, the Beom Island is shown. The Beom Island is the UNESCO Geology Park itself and the sea area around it is the UNESCO Biosphere Reserve where the world-largest soft coral habitats inhibit. For more photos by Jang Hyun-Woo on Nov. 26, see here. Booking a tug boat captain on charge? Saving the sharks but a minnow? On Dec. 3, the Seogwipo Coast guard is told to have booked a captain named Mr. Koh(60) of a 45 ton tug boat named Samyangho 3001 belonging to the Samsung C & T on the charges of faults on work and violations on the law on the management on the maritime environmental contamination. 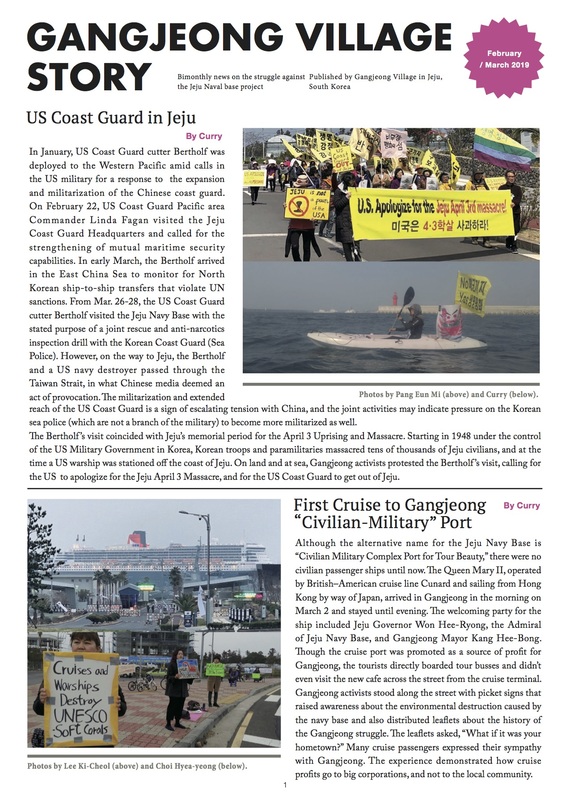 It is told that the Seogwipo Coast Guard booked the captain on charges on the destruction of ship following the fault on work, seeing him have made an accident by neglecting attentive works during the night time operation; and on the violation of maritime environmental destruction in relation to oil leak. Disclose the fundamental reason behind the death of a crew on the day of the budget snatched in the National Assembly! On Nov. 28, the very day that the ruling Saenuri Party unilaterally railroaded 2013 budget bill on the Jeju naval base project in the National Assembly, the problem of the navy’s unreasonable enforcement of construction became obvious with the death of a chief mate, Mr. Kim (43, living in the Jeju City) of a tug boat named Jungseungho (216 ton) at 11:25 am. 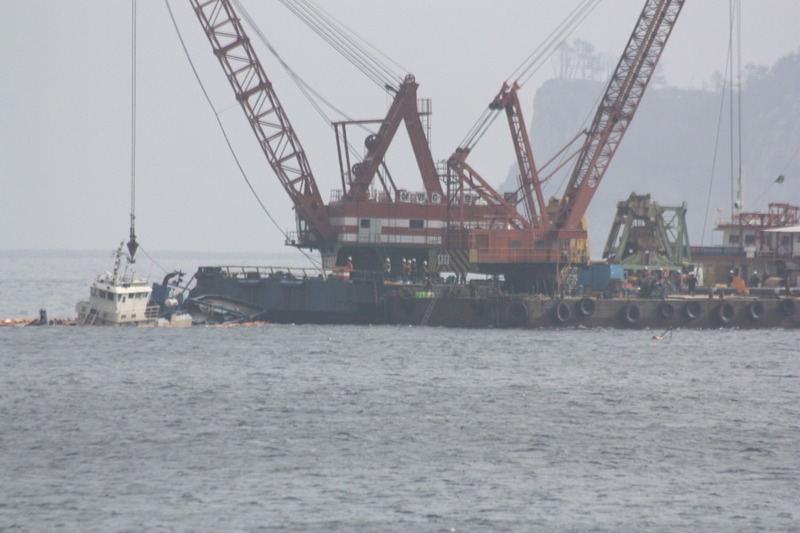 He was hit in the head by rope on the sea 300 meter southward from the Hwasoon port, Andeok-myoen, Seogwipo City. Of course, most conservative media was silent on that most mainstream media did not dealt with it with great concern. According to the Seogwipo Coast guard and headquarter of the Jeju Fire Fighting and Disaster Prevention, 10 meter rope was broken and hit the head of Mr. Kim when the tug boat, Jungseungho, was dragging a barge named Sanchung 2700 with the rope. The tug boat belonged to the T Construction company, a participating company in the naval base construction. Mr. Kim, shocked, fell down into the sea. Even though the captain of Jeungseung No. 3 immediately saved him into the land and moved him to the Seogwipo medical center, he died. The Nov. 28 Jeju media mentioned that the Seogwipo Coast guard is investigating on correct reason for the accident, calling for Mr. Kim’s colleagues. However, we haven’t heard yet on the afterward in the media even after a week. Even though it happened on the very day of the railroaded budget in the National Assembly, the Government and National Assembly evaluated it with weak concern. The exploiting structure on the workers in the construction areas of Hwasoon and Gangjeong should be disclosed. Otherwise, as disclosed by the testimony of a worker who exposed on unreliable caisson production, the workers in Hwasoon are not getting proper wages at proper time. They are also having difficulty to communicate with the foreign workers with whom they can hardly communicate in language in works. The foreign workers are even taking charges of the works as company thugs along with the Korean thugs employed by the companies. 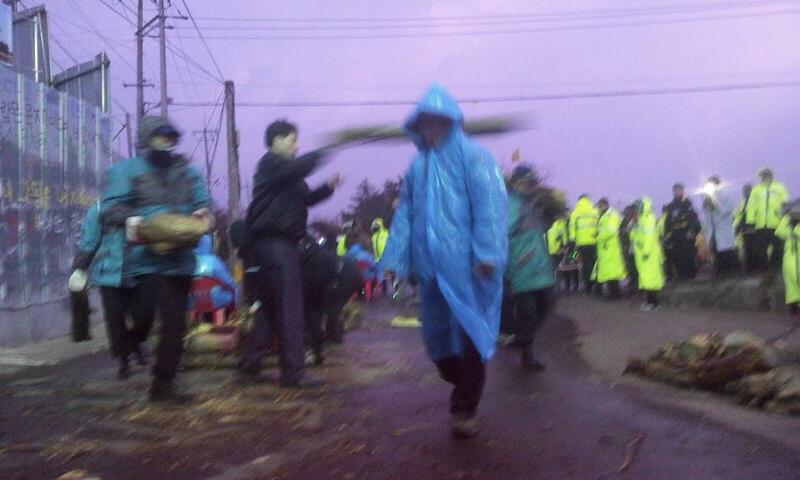 The situation of Gangjeong is similar regarding workers’ job condition. According to the facts disclosed from Nov. 10 to 19 when there were no night time entry/exit of construction vehicles, at least 18 workers have been laid off when they complained on the bad work condition. The workers who came to hear that they would get 4 million won monthly wage and get higher daily wage 150,000 won, compared to daily wage 60,000 won for the Vietnamese workers, were expelled as soon as they taught techniques to the Vietnamese workers and became useless. The Korean workers are told to have questioned why the Vietnamese workers should be employed in the so called National security project and why they so often take photos of construction site with their phones. (Is it right that it is a national security project?) (For details, see here). Salvaging broken caissons by cutting? The Jeju naval base project of irresponsible destruction on environment, occupation and human rights should be immediately stopped and all the budgets on it should be totally cut! According to the Dec. 3 Jeju media, it was confirmed that the navy is considering not to remove seven broken caissons (by typhoons) that became the cause of recent submersion of a tug boat in the naval base construction on Nov. 26 until the typhoon period, next year. Has captain Yoon already forgotten the Nov. 28 accident when a tug boat hit the broken caisson and leaked oil? Does he ignore the fact that the caissons of which each costs 5 to 10 billion won in production and its price is 1.5 billion won have been poisoning the sea with its cement materials and chemicals such as retardation material inside it? Beside safety matter, local fishermen are already having difficulty in navigation and having trouble in their occupation because of caissons put in the sea like reefs. It has already been disclosed that the Office of Prime Minister who declared enforcement of the Jeju naval base construction on Feb. 29, 2012 had replaced official simulation report by the technical verification committee with the report that the Ministry of National Defense had ordered to Samsung and that was merely a reference material. The Government lie and manipulation have been disclosed through the exposure by Jang Hana, National Assembly woman who made public the meeting minutes of the technical verification committee on Oct. 10 and testimony by Professor Kim Gil-Sou, member of the technical verification committee on Nov. 19. Before Feb. 29, there was a declaration by the President Lee Myung-Bak who declared the enforcement of construction in his speech upon the 4th anniversary of his inauguration on Feb. 22. On the same day, the chief of the Seogwipo Police station was replaced with Lee Dong-Min, a man from the main land. And the blast of the Gureombi Rock that would be done for two months started on March 7. If the Presidential Candidates look on such illegal and unreliable national policy project and allow the naval bass budget to be passed in the National Assembly, even though it has become clear that all the state of things were clearly of collusion among the Government, navy and Samsung, they will be greatly punished. Jeon Joon-Sou, chairman of the technical verification committee belongs to the think thank (국가미래연구원, Institute of National Future) of Park Geun-Hye, the Presidential runner of the ruling and conservative Saenuri Party (See here). He has been also promoted as a member of the local development committee on the Jeju naval base project. He has pressured the members of the technical committee not to conclude on construction stop and not to change base layout (* though change of base layout was needed for the proper function for 150,000 cruise), which is told to take 150 billion won more. Park Geun-Hye, Presidential candidate of the ruling Saenuri Party, who says so and so on her ambition to make the Jeju as the 2nd Hawai’i and Moon Jae-In, Presidential candidate of the Democratic United Party who still mentions on the Civilian-Military Port of Call should stop their words on them and take position on construction stop, whole budget cut and revocation of the naval base project! Otherwise, Samsung has demanded 23 billion won reasoning of construction delay. See here. On Jan. 21, 2011, Woo Geun-Min, Jeju island Government and Samsung C & T whose total yearly sale price is 4 times more of the whole yearly budget of the Jeju Island government made a secret contact behind the open cause of the Samsung C & T’s support for the Island Government to reach the goal of 1 trillion won export. If we can say it is Fascism that the root of democracy is destroyed by the corporate greed, we have already seen the Fascism in the regime of the Lee Myung-Bak who originally came from Hyundae. If Park Geun-Hye, the daughter of the military dictatorship, Park Chung-Hee, becomes the President, the Fascism of Samsung will more stifle the Jeju. We should stop this Fascism in Jeju. If the naval base is built in Gangjeong and Jeju becomes militarized, the only jobs for workers would be building of military bases. 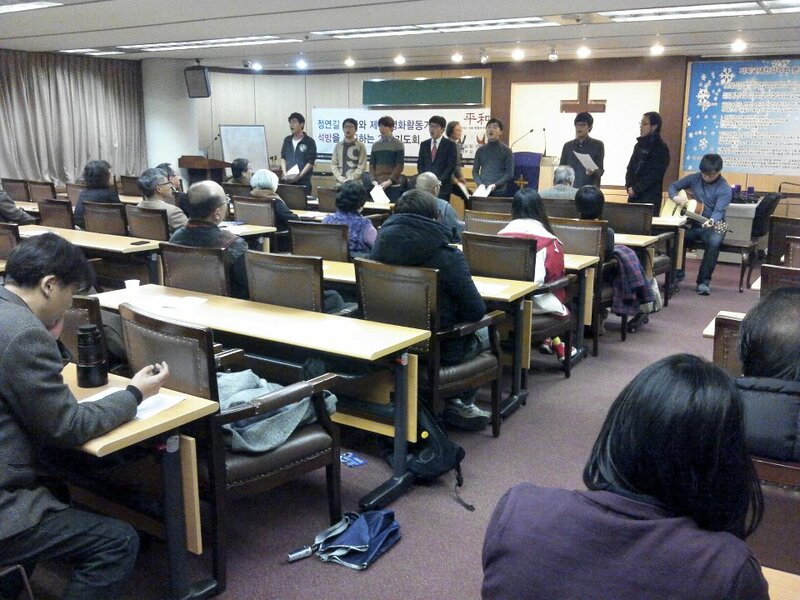 The vision and concrete practice for peace industry is needed than any other time in Jeju. 파손된 제주해군기지 케이슨 1년 동안 묵히나? 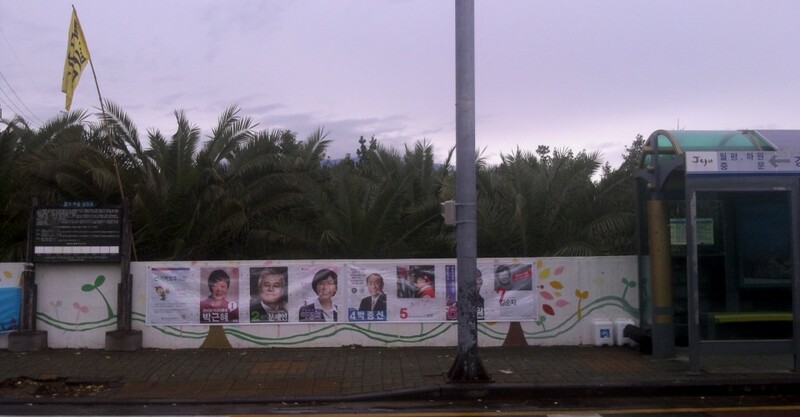 Presidential election poster put on the walls of the village, since the start of the Presidential election period, Nov. 27. Around 5:40 pm, Dec 3, if construction vehicles come, company thugs remove the lumbers people have filed up in front of gate. Then the police remove people. Despite this windy and rainy weather, construction still goes on after weekend break. 24 hour entry/ exit of construction (destruction) vehicles started again on Monday, Dec. 3. 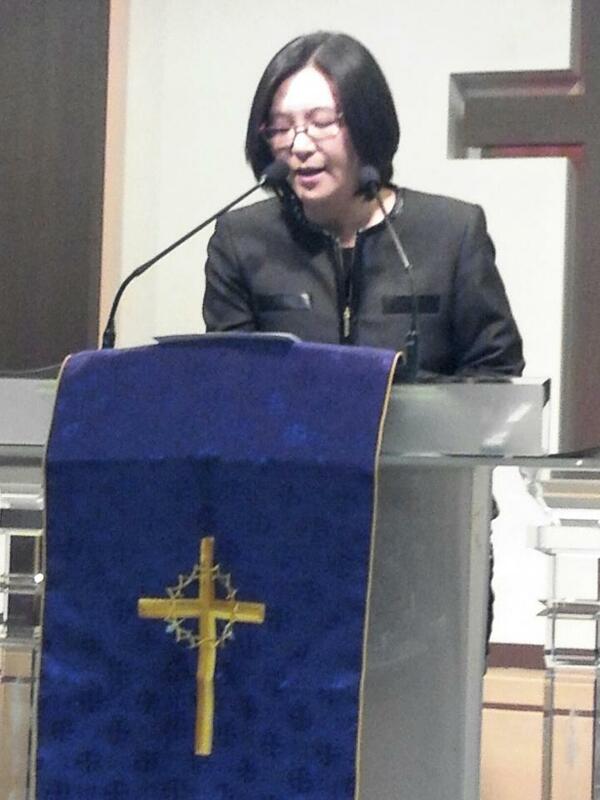 Photo and caption by Paco Booyah/ Jo Hae-Won, wife of imprisoned Methodist pastor Jeong Yeon-Gil, gives a short moving talk at the Seoul 2nd Methodist prayer meeting for the release of the pastor and other prisoners. Pastor Jeong Yeon-Gil has been imprisoned for 89 days since climbing and occupying a caisson dock in September.